Ten Speed Press, 9781607744429, 204pp. A collection of eclectic vegetarian and vegan recipes for singles as well as lone vegetarians in meat-eating households, from the beloved James Beard award-winning Washington Post editor and author of Serve Yourself. Whether you’re­­ a single vegetarian, an omnivore who’s looking to incorporate more vegetables in your life, or a lone vegetarian in a meat-eating household, you know the frustrations of trying to shop, plan, and cook for one. 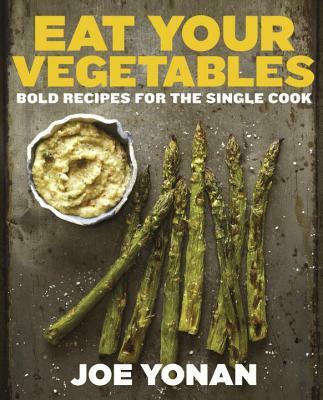 With Eat Your Vegetables, award-winning food editor of The Washington Post and author of the popular column Cooking for One, Joe Yonan serves up a tasty book about the joys of solo vegetarian cooking. With 80 satisfying and globally-inspired vegetarian, vegan, and flexitarian recipes such as Spinach Enchiladas, Spicy Basil Tofu Fried Rice, and One-Peach Crisp with Cardamom and Honey, Yonan arms single vegetarians with easy and tasty meal options that get beyond the expected. In addition to Yonan’s fail-proof recipes, Eat Your Vegetables offers practical information on shopping for, storing, and reusing ingredients, as well as essays on a multitude of meatless topics, including moving beyond mock meat and the evolution of vegetarian restaurants. The perfect book for anyone looking to expand their vegetarian and produce-based repertoire, Yonan’s charming, personable voice and unfussy cooking style encourage home cooks—both new and experienced—to take control in the kitchen and craft delicious veggie-centric meals for one. Joe Yonan is the James Beard award-winning author of Serve Yourself: Nightly Adventures in Cooking for One, which Serious Eats, the San Francisco Chronicle, and blogger David Lebovitz named one of their favorite books of the year. The book was an outgrowth of his monthly column, Cooking for One, for The Washington Post, where he is Food and Travel editor. Joe holds a professional chef’s diploma from the Cambridge School of Culinary Arts outside Boston and a bachelor of journalism from the University of Texas at Austin. He lives in Washington, DC.